My son, Braxton did not grow up in the age of when Teenage Mutant Ninja Turtles were popular, so he was not really into them like my older son, Jonathan (who is now 21). It was not until the new Teenage Mutant Ninja Turtle movie came out that he really began to take notice of those Heroes in a Half-Shell. 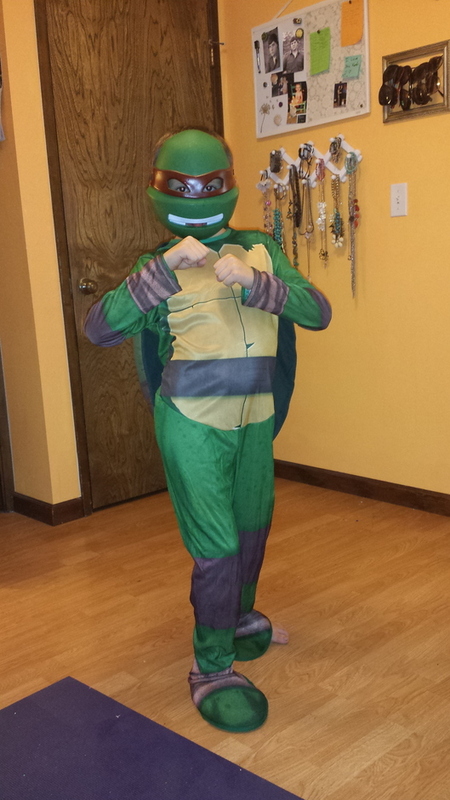 Needless to say, Braxton was thrilled to get the chance to review a Teenage Mutant Ninja Turtle costume from our favorite costume retailer, Anytime Costumes! Braxton chose the Boy's Teenage Mutant Ninja Turtles Raphael Costume. Look at him below, ready to fight off the bad guys! I love the costumes from Anytime Costumes! This Ninja Turtle Costume definitely did not disappoint! It is made of high-quality, sturdy fabric. Not the cheap type of flimsy fabric that falls apart like other costumes I have bought elsewhere. My son gets many hours of fun in his costumes that we have received from Anytime Costumes! Anytime Costumes is one of the largest, most popular, costume shops on the web! You will find Adult Costumes, Plus Size Costumes, Kids Costumes, Accessories & Makeup, Masks, Wigs, Hats, Clearance Costumes and more. I will always be getting all of my costumes at Anytime Costumes! Disclaimer: I was sent a costume to review and to keep. All opinions are my own.